The weeks leading up to Newtons 2017 would have to be some of my most frantic weeks ever. I was bouncing between radio stations doing interviews to help hype up the event, not just for the local community, but for national air time as well. With the excitement surrounding the return of Newton's, the flood gates opened on the registration page. People began to book their trips to my home mountain, including my Rayne team mate Brian Choi from Canada. Thursday we unloaded 650 bails of hay and positioned them along the track. 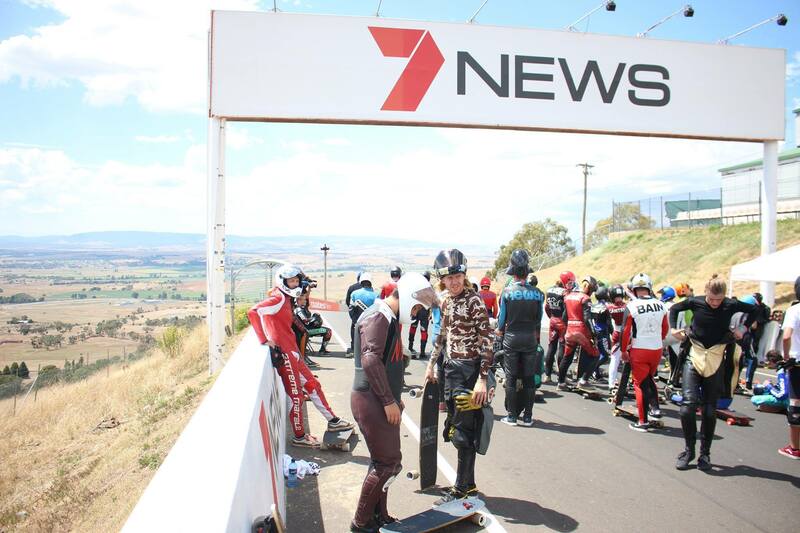 It was that day that the stream of riders began to flow into Bathurst, and in the afternoon it was easy to spot the skaters arriving at the hill for sign in. One by one, everyone disbanded back to their camps whether it be on top of the mountain or in the lavish hotel at the bottom of the track. The anticipation for what Friday would hold was immense. 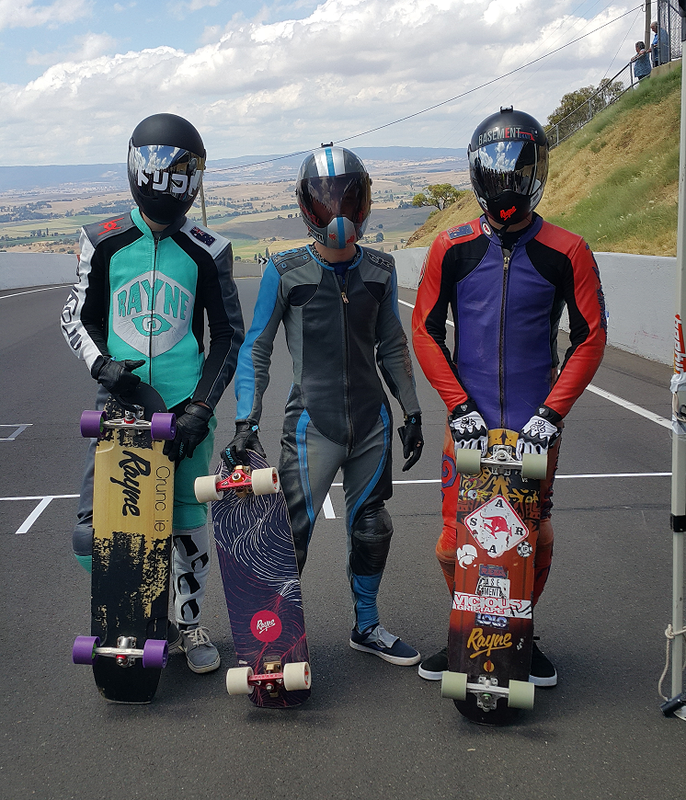 Friday morning arrived, sun shining and skaters could be seen filling the skyline of Mount Panorama. After some short delays and some more media interviews, all the skaters were about ready to jump out of their skin. Jacko Shaperia was at the front of the line, as always getting the first run down. It was a bit surreal to see skaters on the mountain again! Everyone’s first run was chill but soon the times began to drop as the speeds began to rise. Along with this came the first of the shark attacks (Australian for Crashing). Even though the track had been untouched for four years, it still holds up to be one of the more dangerous races with the first day alone claiming several victims. Needless to say the ‘Meat Wagon’ got a good workout. 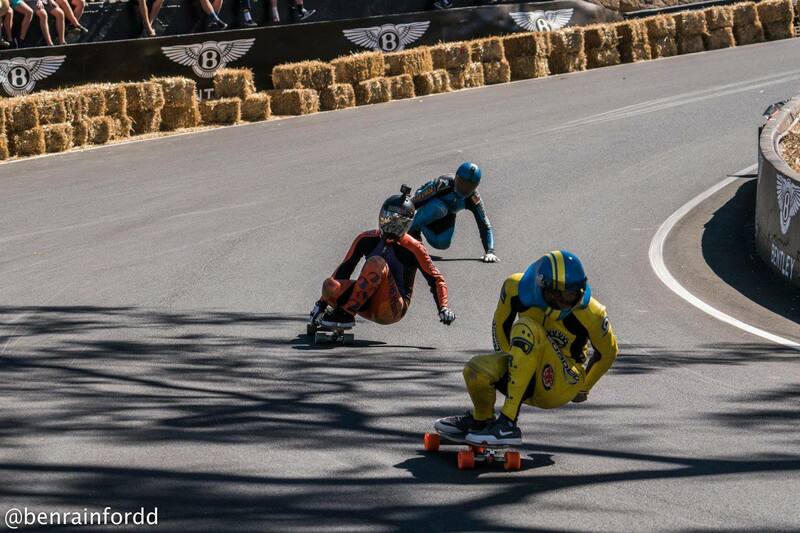 Unfortunately, my friend and fellow Rayne rider Lachie Re was one of the ones injured, fracturing his arm in two places. Shout out to Lachie! Hope you heal up quick. Saturday was a day full of Action, We saw times go sub 1 Minute for nine riders (including myself). Mauritz was the first to break the magic minute and finished the day with a 58.37. I finished up sixth in qualifying, and made it through to the top-ten shootout. There, no one could top Mauritz. After that, the team race would round off competition for the day. There was a lot on the line (a keg of beer), so I teamed up with Brennan Bast and Max Heaton, but we came into the race with very little tactics. The format was 3v3, and the last person across the line would eliminate their whole team... We were ejected first round, but I was more than happy to watch the New Zealanders Api, Callum and Devon take home a convincing win. In the late afternoon, on top of the mountain, the Skate of Origin Game 2 took place. It's an Australian Rugby style touch football game, which originated at Mount Keira last year. It was a well-fought battle by both teams, but with more focus on stoke than competition. We all knew Sunday was the real game day. Sunday came, and I choose to catch up on some sleep while the repechage heats were being raced. I got to the mount and everyone was in race mode: fresh wheels, grip and even gloves were being put on. Everything had gone serious. However, my first heat was super fun. Duddy crashed on the push and chose to stay at the top. I lead into Forest's Elbow before Chris Hardy came down on my inside, throwing an awesome left lane predrift. He was going to chop the hell out of me, but came unstuck as the warmer weather had made the course more slippery. 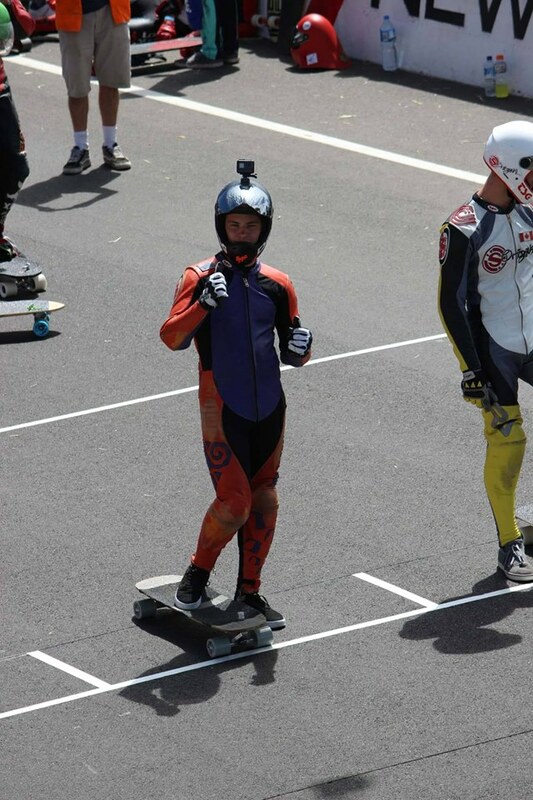 I flew across the finish line with Taylor Cook (Grom Champion) behind me. The next round was straight forward. I pushed in front and held my position. Top 16 came, and I pushed into 2nd behind Alex Charleson, followed him down the track and took a comfortable 2nd. Semis however was stacked. Bast was out in front and threw a tiny footbreak into Forest's. Unfortunately, he ran out of grip and flew into the bails. I managed to dodge his board, but Alex clipped his back truck, blew out the kingpin, and went flying. This allowed Daniel Engle to swoop 2nd and move on to the finals. It was amazing pushing it in behind Mauritz. I followed him into the Dipper, followed his line and tried to stick with him. He got a little bit of a lead, and coming into Forrest’s Elbow I could hear Kyle behind me. He dumped a foot, and I could probably see the smoke if I had turned around. We all scrubbed through Forrest’s and lost a bit of speed, but I ducked back in behind Mauritz to tried and catch his draft. I caught a little bit of it, and got overexcited, popping out too early to try and overtake. This set up Kyle with the double draft to the finish line. It was super close with Mauritz taking the win by inches. A huge thanks to the whole Asra Crew. Notably: Haggy, James Hopkin and Tony Streets. Thanks to you guys and all the volunteers, the weekend went off without a hitch. Thanks to Local councillor Warren Aubin for the huge drive he put through to council to seal this event for us and helping us with all the negotiations. Final Thanks to my dad James. I expressed how much of the need there was for this race while I was travelling, and he helped get the fire started for us all. So thanks again! Bring on Newtons 2018! My next Skate adventure will be to South East Asia to compete in the next leg of the IDF tour. I'll be starting in the Philippines and moving on to China, and finally South Korea. This is a three week long tour jam packed with tons of skating and new experiences and I cannot wait! Between now and then I am back into exploring around my own country and producing more videos so keep your eyes peeled!